Caffeine can trigger migraines, heartburn, gastrointestinal ills, the "jitters"
Doctor: Effects are "very short-term" and "have no long term consequences"
ATLANTA, Georgia (CNN) -- Double latte in the morning, soda with lunch, energy drink at midday. Sound familiar? 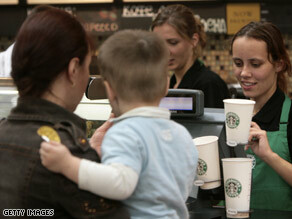 More moms say they're leaning on caffeinated beverages to get through the day. Note: Energy drinks and soda estimates are per can, ranging from 8 to 18 ounces. Coffee and tea estimates are per 8-ounce serving. But what effect is that having on your health? Research shows that caffeine can trigger migraines, heartburn, gastrointestinal problems and put women at an increased risk of miscarriage. Caffeine consumption also has an impact on your heart. Dollar says that although he recommends limiting caffeine intake, other lifestyle habits are more damaging to your body. "There are a lot of things I spend time counseling my patients about, such as overeating, smoking cigarettes and drinking alcohol, but I don't spend a lot of time worrying about caffeine consumption." The bigger issue may be the addictive nature of caffeine. "Needing any type of stimulant to get through your day is dangerous," Dollar noted. One way to boost your energy naturally is develop a balanced sleep schedule. According to the National Institutes of Health, most adults need seven to eight hours of sleep a night. You can fall asleep quicker by not consuming caffeine after 5 p.m.
"It turns out that caffeine actually lasts in your body for quite a long time," Dollar said. "It takes about five hours to get rid of half of the caffeine you've ingested." Proper diet and exercise also play a role in your energy level. MayoClinic.com: How much caffeine is too much? DeGroff suggests that amid a busy schedule, striving to take at least 10 minutes out of your day for a break can make a difference. "Close your eyes or read a book, just look for something to restore your natural sense of moment. It will elevate both your energy and your mood." Like most things in life, the key to caffeine intake is moderation. Experts agree, 200 milligrams of caffeine a day is a healthy amount. That is between one and four drinks, depending on your caffeinated beverage of choice.